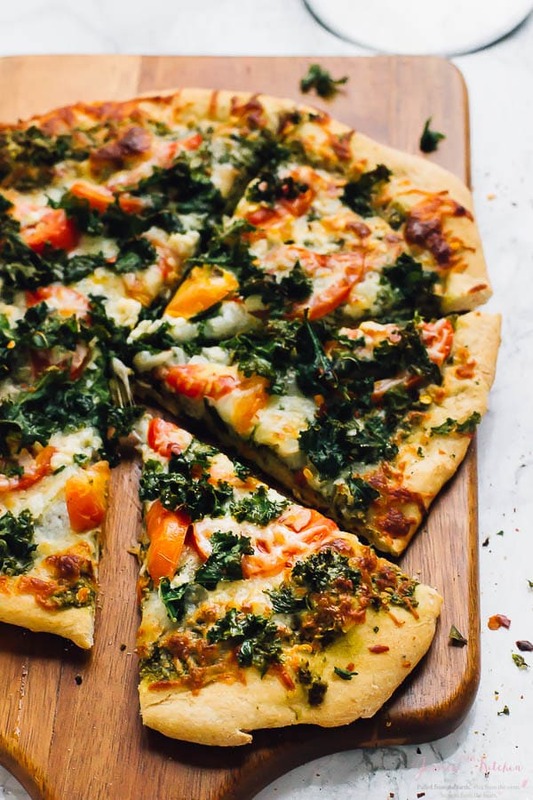 This Kale Pesto Pizza offers double the kale with a garlicky kale-pecan pesto and crispy kale chips on top of this addictive veggie pizza! There’s a super easy vegan and gluten free option! So here’s the thing: I can always never say no to a pizza. I’ve pretty much had every variety; pizza bites, gluten free pizza, vegan pizza, raw vegan pizza, pizza with fruit, grilled pizza…the possibilities are endless. I’ve had pizza straight out of a wood fire pizza oven in Italy, and made insanely fresh and divine in the hills. Does this mean I’m a pizza expert? I don’t know, but it means I LOVE pizza and would have it daily if possible. Let me tell you, this Kale Pesto Pizza is so good. I’m talking, I had to hide what slices I couldn’t stuff down so that I could enjoy leftover pizza the next day. Madness. Truly. 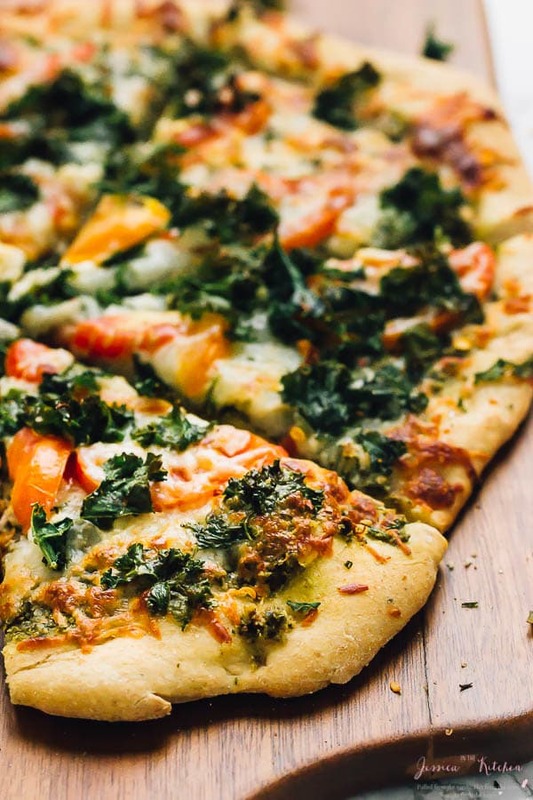 The combination of garlicky kale pesto + crispy kale, cheese, farm fresh tomatoes and good dough was a real show stopper. Set this recipe aside for pizza night. Your guests will love you for it! Truth is, and if you follow me on Instagram you’ll know, I’ve been promising this Kale Pesto Pizza recipe. Since. Last. Year. I know, I know. I kept waiting for the ‘right time’ but is there ever a wrong time for pizza? Exactly. Pizza time is always the right time. I’ve been making the kale pesto for a few years now, and it seemed like the perfect addition. I usually use pistachios and pine nuts, but only had pecans on hand. I actually love the texture. It is perfect for the pizza! You can even make it ahead if you so desire. I love to roast the garlic that’s in it, but it isn’t mandatory. The kale on top of the pizza is a no brainer. At 500F degrees in the oven, the automatically transform into crispy kale chips. I love to drizzle the pizza with a bit of olive oil first to help the chips crisp up even more. 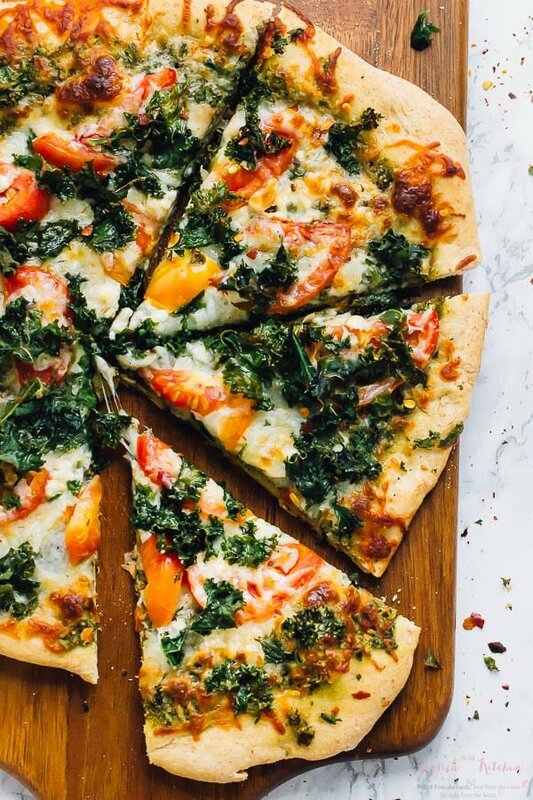 Remember that you have total flexibility when it comes to this Kale Pesto Pizza. Add more kale, or even less tomatoes. 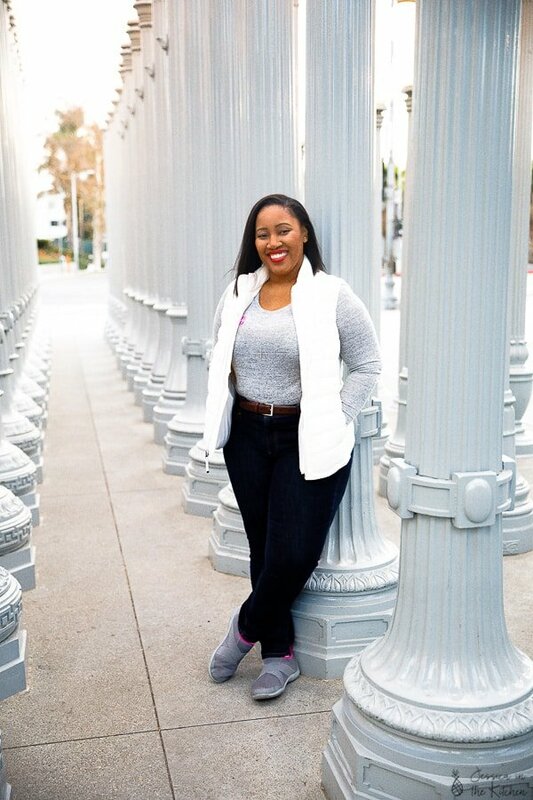 My measurements are for what I love. You could even add MORE garlic, which gives it even more flavour! Eggplant would also taste amazing here. All in all, enjoy the pizza. P.S. I love to scatter some cheese over the crust since it gets kind of crispy, which I die for. I ‘healthified’ my go to crust so that you’ll also feel good knowing you’re putting in a whole lot of good ingredients while chowing down this pizza. 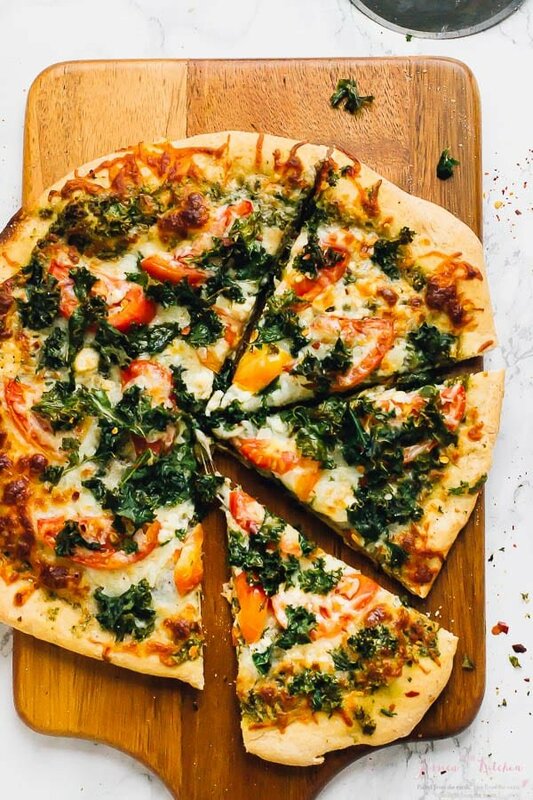 If you try this Kale Pesto Pizza please let me know in the comment section below, or tag me on instagram with the hashtag #jessicainthekitchen! For more exclusive recipes follow me on Instagram AND on Snapchat: jessinkitchen. Add kale and nuts to a food processor or high speed blender and pulse until combined, scraping down the sides after a each pulses, for about 2 minutes. Add the olive oil, roasted garlic, salt and pepper next and continue to pulse until combined, for about 2-3 more minutes. Feel free to add more olive oil if you want a more runny consistency, or more nuts if you want a thicker pesto. Preheat oven to 500 F degrees. Place the pizza on a pizza stone (preferred) or baking sheet with a silicone mat. On the pizza dough, spread the kale pesto over the pizza. You may have extra, which you can put on anything from sandwiches, to flatbreads to pastas. Top with the mozzarella cheese, the tomato slices, and then the chopped kale. They can overlap the edges of the crust if you'd like, or you can leave it bare for a solid crust edge. Drizzle olive oil over the top. Place in the oven and bake for 8-12 minutes, until cheese is bubbling, kale is crisp, and the dough is ready. Check to ensure it isn't burning after the 8 minute mark. Remove, let cool slightly, and enjoy! 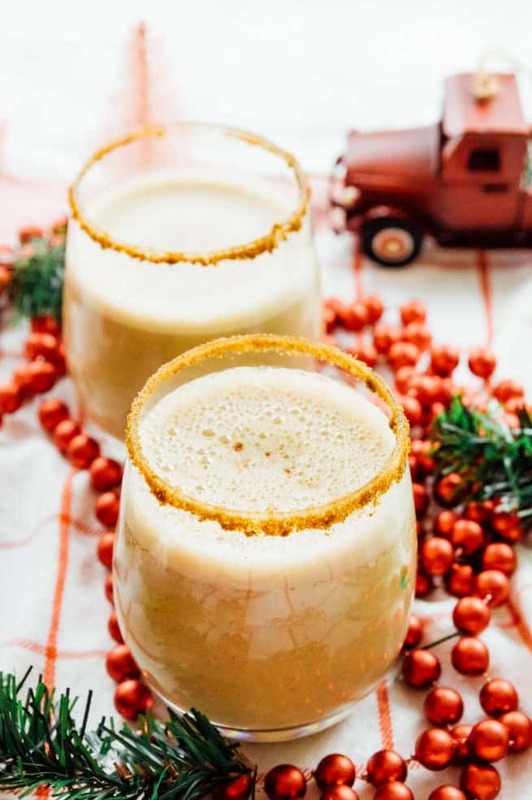 This recipe has vegan and gluten free options. I recommend using fresh, organic ingredients for the best result. 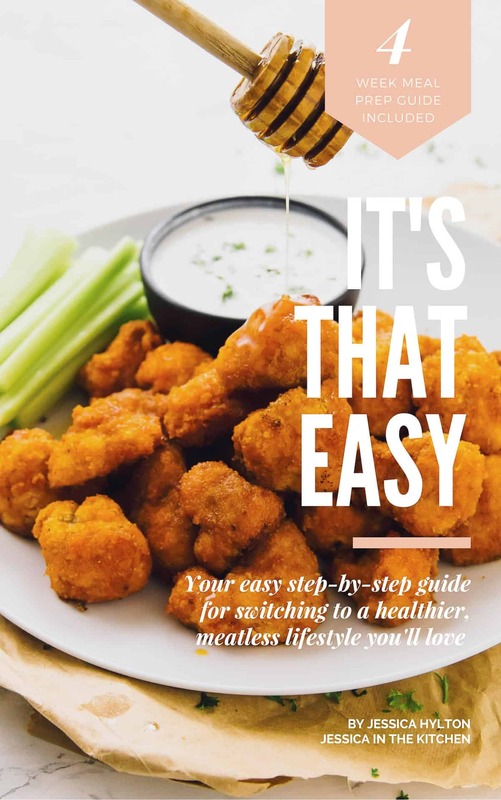 ANNOUNCEMENT: I FINALLY wrote an Ebook! + Sign Up for Early Bird Pricing! Such a wholesome pizza! I love that kale pesto, Jessica. What are the vegan shreds? Thanks Angie!! Vegan mozzarella shreds, like from daiya or other vegan companies! Made this today! I had to replace the kale with spinach (totally thought I had kale). Nonetheless, I enjoyed it!! Thanks!